QiuQiu: To a humble Little beginning..
Sup you guys!!! Sooooo happy i have some spare time tonight (after a good 3 hour nap!!! =DDD) to really sit down and blog ^.^ To update my blog with the things i've been doing..
You guys know i just launched GIRLYMake right =))) Lotsa blogger and friends have been very very supportive and i am very thankful for all of them =') Will blog about it real soon! Today i wanna share about Little Thoughts =) It's a floral and gifts company my sister started and i only got involved about 4 months ago. And since then we've been planning for its launch. She's been doing floral services for friends / friends' friends and all as a passion but never really make money lah, just doing it cox she enjoys it a lot. And now she's quit her full time job to do what she love.. That's courage. And i guess it's her love for floral that made her do it. But in the last three months of working on Little Thoughts i've come to learn that flowers make such a beautiful difference to everything. Everything. And you know i've always enjoyed gifting ^.^ I love to send people stuff that i think they'd like! Cliche much but i think the joy of giving is one of the greatest joy. Haha. And my sister is also a very giving person lah. We both vying to be my dad's favourite daughter. Hahaha. She brings my parents overseas a lot. I also don't wanna lose one, i also bring. Lolol. Anyway so together, two of us decided to start Little Thoughts! With the help of her husband, and my husband, my dad and mum and sisters, we did a lot of trial and error before deciding on what goes on our catelogue. Spent a lot of weekends (and money =X) on flowers and more flowers and also on goodies. Tasting them to make sure only good products goes inside the gift hamper. Only things we would like for ourselves =) No strange brands, no replicas of other brands, only good reliable recognised items. We are offering FREE SHIPPING for all orders. And a 10% off for orders made from now til end of December 2013. 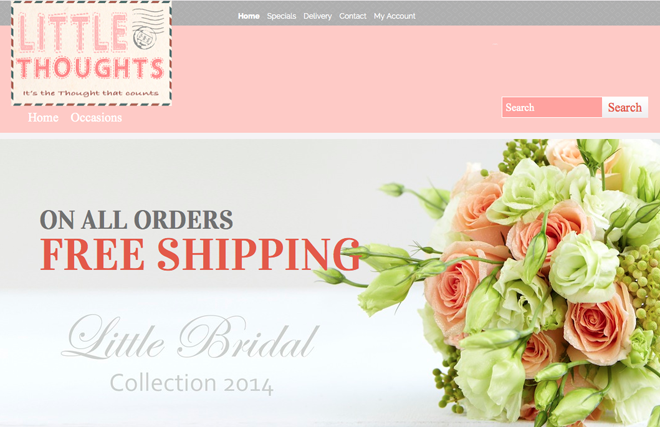 You're looking at our Bridal collection ^.^ Brides to be, go have a look. Can you believe it?!?! My sister made this bouquet it's so beautiful i am so proud of her! And finally our humble Little website is up ^.^ Special thanks to the help from our website designer (Chloe Design) for the speedy good job and Josh for the beautiful photography (http://ebeb.com.sg)! Chloe is also helping me out for GIRLYMake, i'd share more about her work soon! Alright, please like us on Facebook and follow us on Instagram and share what you might like with people who might like it haha! ^.^ My sister strongly believes in Facebook though i believe more in blogging and Instagram. Lol. Also.. If you're wondering why we're call Little Thoughts.. It's cox we think that it's always the Little Thoughts that count.. When you think of someone. When you miss someone. When you wanna thank someone. When you wanna say sorry to someone. And that's something my sister always do. She is a clown to her family, friends and loved ones hahah. Not really clown-clown but her motive is always to make people happy and laugh. She took a big leap to quit her job but man.. She is sooooo loved by her colleagues i feel bad that she left her job!!! There were a lot of crying i heard O.O She's a Human Resource Manager. All you working adults, you all got so love your HRM one or not? Hahaha. And other than the many many many farewell gifts her colleagues got for her (if you're keen to see you can follow her on her Dayre hahaha she very active there), they also made her these. When she got home Baby Yurou shout "妈咪 你回来啦!!!" Hahaha it means "Mommy you're back!!!" and then Baby Yurou go on to say everything is hers. Lolol. 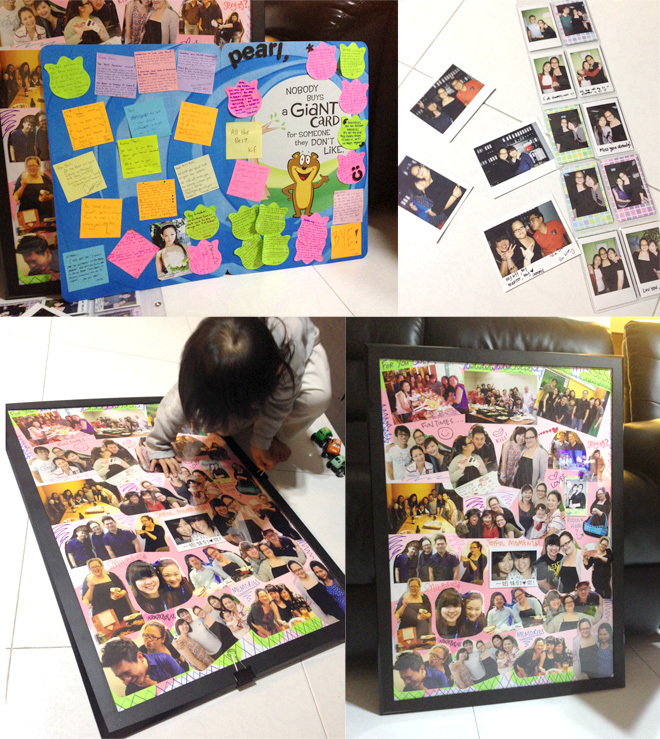 The huge card, the gifts and the pictures, she say it's all hers. This Yurou got more naughty not haha. I took pictures of all these cox it'd remind me of what a big step my sister have made to keep her dreams (since teenage!) alive. That is for her to run and flora and gifts company. She got out of school at the young age of 13 and started to work for a few companies. Most of them are customer-service related in F&B or floral and gifts companies. And now she finally gut-up and do it for herself.. I AM VERY PROUD OF HER!!! ^.^ Though it must have been had for her to leave her colleagues =( But she say one of the main reason is also cox she really wanna spend more time with Baby Yurou. 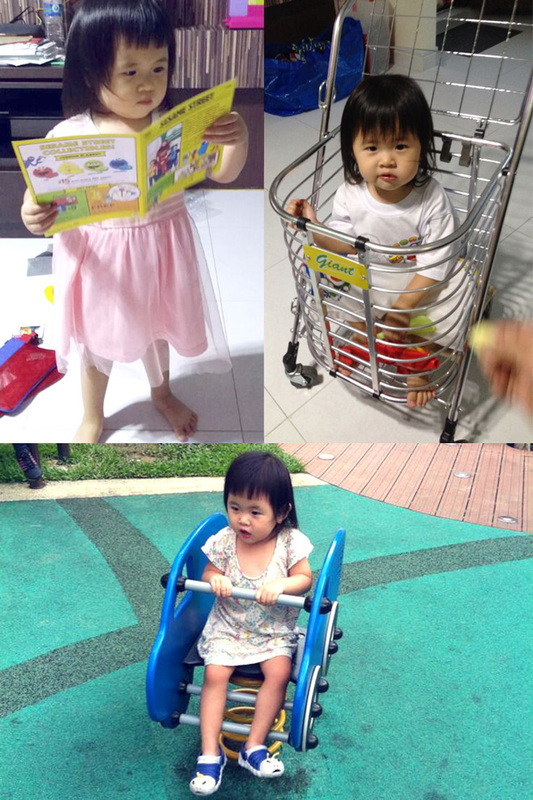 Naughty girl grow up very fast!!! She and her mum so same-same like photocopy machine come out one. She see Hello Kitty she will go OH MY GOD!!! WO DE!!! Hahaha. Her mum eat until so old and so dua bong also go "OH MY GOD!!!" 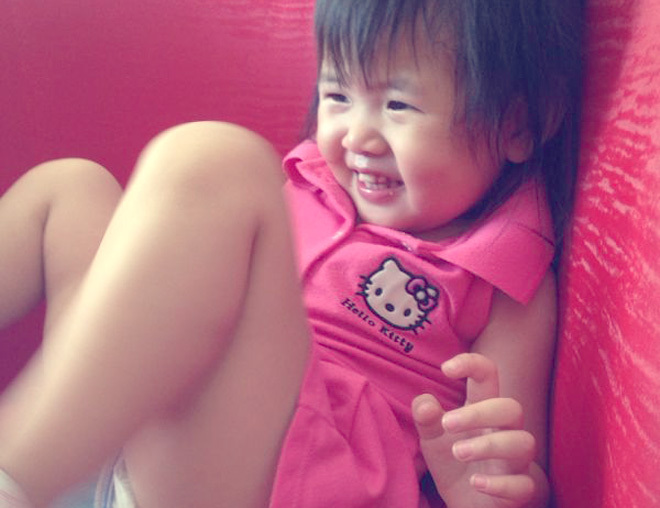 when she sees Hello Kitty. Since my sister left work she indeed has more time to spend with Baby Yurou and can send me more pictures and videos of Baby Yurou hahaha YES!!! 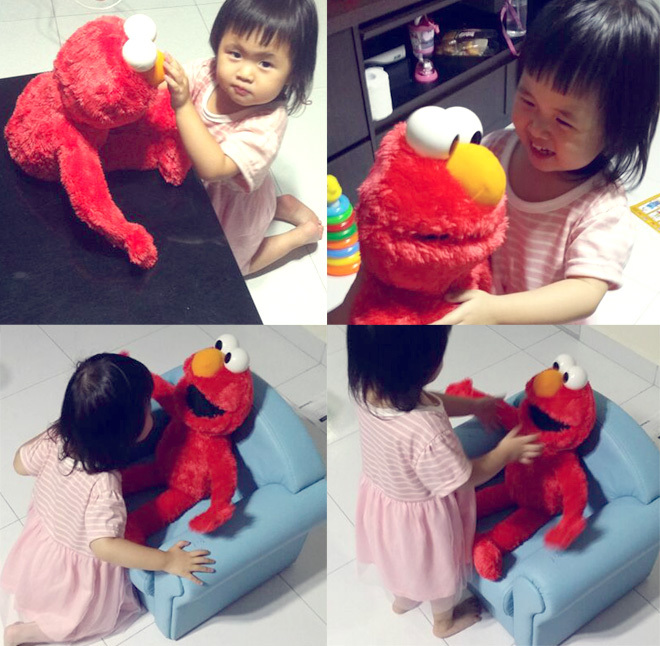 Hasbro Singapore sent Baby Yurou a Christmas present ^.^ And she loveeee it!!! 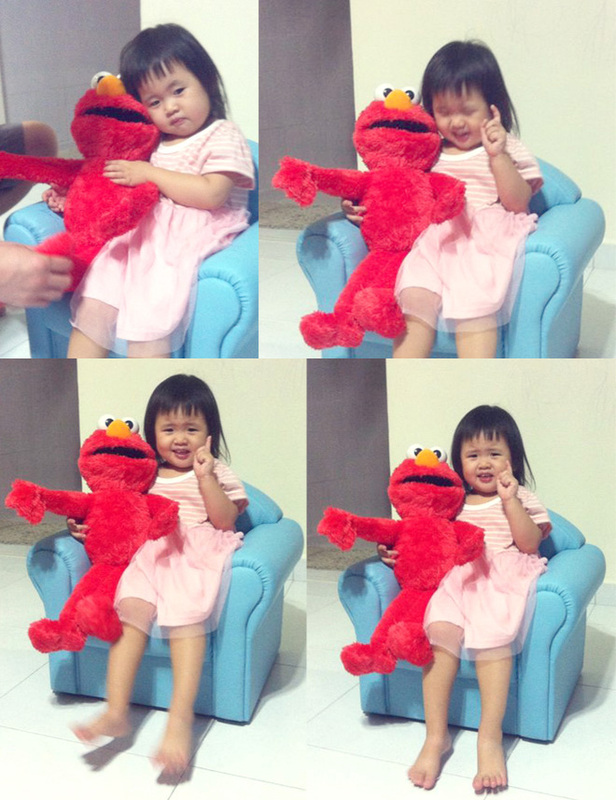 She love it so much she lets this giant Elmo sit on her sofa. We call it the chair of command cox she always sits on it and slave people around!!! "拿这个给我!!" if not it'd be "拿那个给我!!!" =___= This little boss not easy to serve hahaha. But my whole family serve her until damn happy. More pictures of her and her new buddy. You wanna know how much she like her new buddy? So much she share her chouchou with it. Hahahaha. 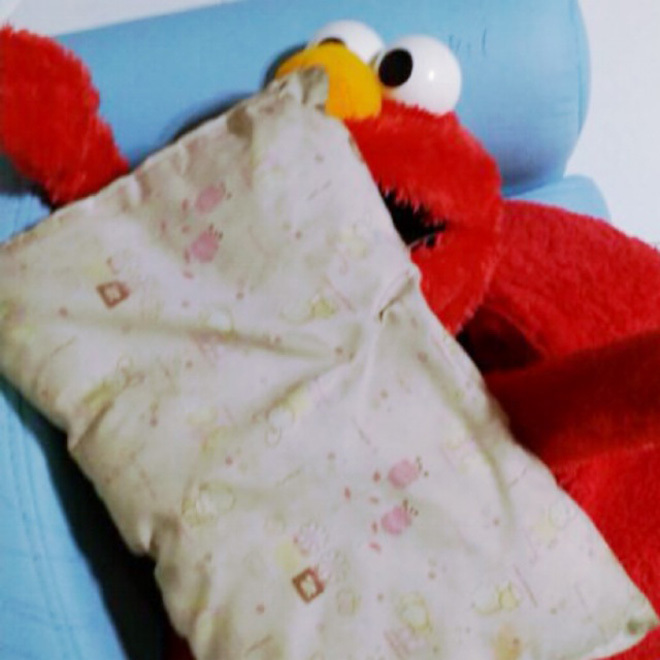 She go and put the chouchou on Elmo and then position the corner of the chouchou at Elmo's nose hahahaha. Very humorous hor my baby niece. Okay lah! Don't say dee. Please support Little Thoughts!!! Wooo!!! Hahaha. If you don't support, Baby Yurou will starve cox no money to buy milk okay. My sister Pear Lang say one. 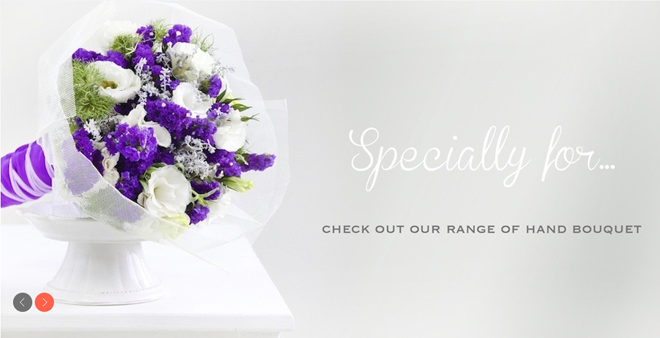 And of course, if you need bouquets for your special day or for a special someone, my sister Pearl can do it for you also! 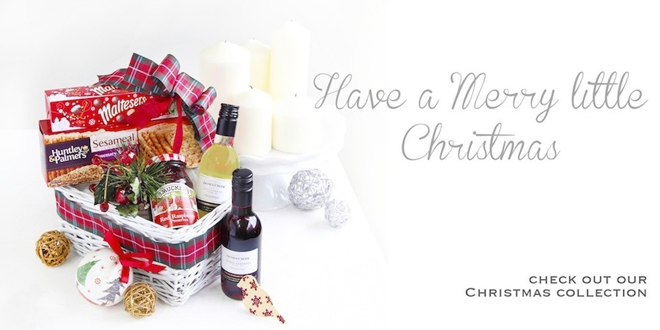 ^.^ Visit our site to check out our bouquets and also hampers for this Christmas! Visit our online store and share it with your friends if you might! And erm.. I'd just get back to do factory-girl manual work of packing for our orders and cutting ribbons and wrapping paper @. @ That's what i've been busy with.